All cat trees offer felines exercise and some environmental enrichment. If you don't like the look of the typical pet store options, consider giving your cat a climber that looks like a real tree. 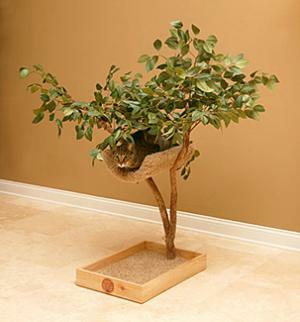 Cat trees made from real tree branches, or close simulations, can be difficult to find at your local pet supply store. However, realistic trees make a fun place for your cat to play safely without tearing up your furniture, and they can also be a beautiful addition to your décor. The following online shops sell hand-crafted trees that just might make your cat think she's playing outside. CatsPlay has an assortment of beautiful trees covered in silk leaves. Each of these cat trees is made in the USA and comes fully assembled, but there's about a four to six-week wait for your tree to be manufactured and shipped. Seedling - This extra small cat tree measures 17 W x 25" D x 36" T, and it has a square bottom perch and a comfy, semi-circular perch higher up in the tree. It's priced at approximately $339. Resort Luxury Tree - This tree has a lot of leaves that conceal three perches. Most cats will love the extra privacy, and the perches swivel so you can occasionally change positions to help prevent boredom. The carpet on the unit can be removed for cleaning. The base is about 30 inches in diameter, and the tree stands approximately 48 inches high. It's priced around $500. 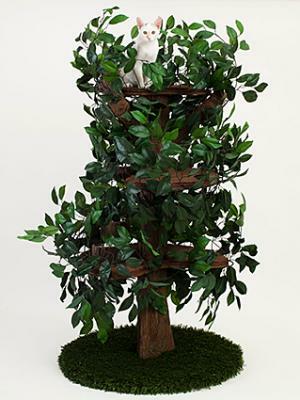 Cat Palace carries about eight different realistic-looking cat trees. The trees are made in the USA from real dragonwood left in its natural state. Prices range from approximately $129 up to $1,499, and it can take anywhere from two to six weeks for delivery depending on which model you choose. The trees are all made to order so all sales are final. Scratching Tree House - This is the smallest tree Cat Palace offers. It sits on a base that's 16" x 16" and it's 41" tall. The branches are covered in silk leaves, and the tree is wrapped with 26" of sisal cord rope for scratching. If you only have a small space or a small cat, this tree might be a great choice. If you have a fairly large and active cat, the Scratching Tree House might not offer enough of a challenge to your pet. It sells for about $129. Sycamore - This tree measures approximately 28" W x 28" D x 72" T. The bases is 16" x 24" and the tree weighs about 80 pounds total. It comes with three platforms in addition to the base, and the natural movement of the upper branches is designed to pique your pet's curiosity and make playtime more enjoyable. The carpeting on the unit is removable to make cleaning easier. This is a good unit for a cat that likes to climb high. The cost is about $800. Mature Cat Tree House - This tree stands seven feet tall and has four platforms, as well as a house on the base. Multiple cats could enjoy this large unit. The house on the bottom measures 33" x 25" x 22" and two of the platforms are 16" x 24" and two are 16" x 116." This is their most expensive models and sells for around $1,500. If you want to give your cat a luxury tree, Fantasy Forest has a number of unique designs that are made in the USA. You can choose the finish on your tree, from fabric to polyacrylic-coated to simple painted wood, and the leaves are made from microsuede. The inside of the trees conceal steps your cat can use to climb up the tree or take a secluded nap. Scroll down the page after you click on each example of their trees. Lil Hickory Tree - This is the smallest model measuring 33" W x 22" D x 32" T. It comes with one treetop platform for your cat to perch on. Depending on the finish and upgrades you choose, the price ranges from as low as $450 to a little over $500. You can also order with the leaves removed if you have a cat that likes to chew on fake plants. Enchanted Tree - The dimensions on this tree are 42" W x 28" D x 72" T, and it has two perching platforms. There's also a hiding area at the bottom This base price on this model is around $800. Hidden Hollow - This tree comes with three tree-top platforms, and its dimensions are 48" W x 26" D x 72" T. Pricing on this model runs from about $940 to $1160. Additional models of this tree are available in 6 through 10 feet high and are priced accordingly. Fantasy Tree - This tree has four shelves inside the tree trunk, a hiding space in the base, and five perching platforms. The tree is 55" W x 44" D x 120" T and pricing starts around $2800. This model would be a good choice for a multi-cat household. There is one major drawback to getting a Fantasy Forest cat tree. There is a long waiting list because the company can't keep up with the demand. Some trees were featured on the TV show My Cat from Hell with Jackson Galaxy, so they've definitely become a hot item for cat parents. Unless you're very patient, you might want to consider shopping elsewhere. 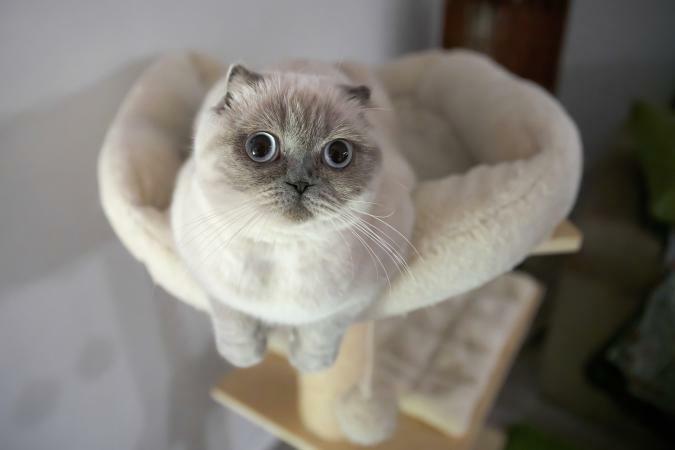 If you can't find the type of cat tree you are looking for in a price range you can afford, consider checking with a local carpenter. If you can give him or her a sketch or image of what you would like, a local woodworker may be able to create a cat tree to your specifications. You might even save a little money by using a local craftsman.